When I was in elementary school we did a poetry unit and had to write a haiku. All of our haikus were published in a mimeographed book that each student got to take home at the end of the year. I, like most of the other students, wrote a haiku about Dogs. I don’t know why I wrote about Dogs. I don’t particularly like Dogs now, and I didn’t particularly like Dogs then. 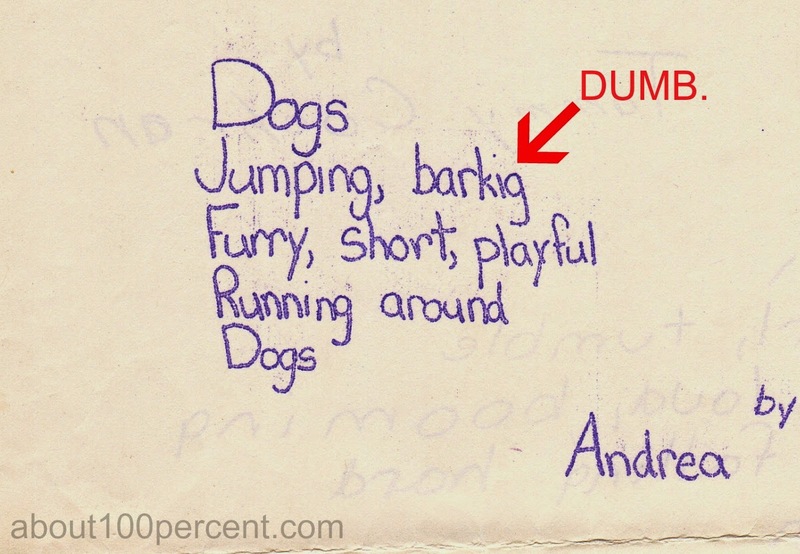 Probably I wrote about Dogs because everyone was writing about Dogs. One thing I remember about that book is that I misspelled a word in my haiku about Dogs and I was so embarrassed because now everyone had a copy of the book of haikus and mine had a misspelled word in it and probably everyone thought I was stupid. Also I really prided myself on my spelling prowess in elementary school and I couldn’t believe that I misspelled a word on my haiku, which is like a form of poetry that uses the least number of words and how could I have misspelled one of them? Idiot! Note: During the writing of this post I was curious about whether my memory was correct and I actually did misspell the word I was thinking about, or if it was someone else. How much more embarrassing would it have been if the young poet I remembered and am now skewering for having terrible spelling skills was not me but in fact one of my classmates? Who has found me on the internet and secretly reads my blog and is about to connect with me by leaving a comment or a note on Facebook or even an email that says Hey, Andrea! Remember me from elementary school? I read your blog and think that you are truly a gifted writer! Let me pay you a million dollars! They would be offended and that would be tragic for me. I found the book. It was just two pieces of paper stapled together. Not quite a book, you see. Imagine my surprise when I saw that they weren’t even haikus! They were Cinquains. Do you know the art of Cinquain? Well according to my research*, it is a form of poetry that uses the subject of the poem as the title and first line, and also the last line. In between there are three other lines that describe the thing you are poem-ing about. Settle down, now. I was not a poetry major, okay, Angie Dickinson? that person would think that a Dog is the most annoying animal ever. I was inspired today by the leaves that I still see falling outside, despite the trees possessing no leaves to speak of. It’s a mystery of nature, the falling of the leaves. It’s also sort of maddening. To rake all those leaves. Clean the house this month. *information obtained by reading through two pages of elementary school cinquains from 30 years ago. Prompt #3: Write a haiku about what you see out your window. Oh my gosh, this was hilarious! Well, I feel dumb because I did Haikus too, for Mama Kat's and I capitalized Haiku every time I typed it. I don't know why. But now I see that it doesn't need to be capitalized. Dumb me. I feel like you with your misspelled barking. LOVED your Haiku. And I totally learned something about Cinquain, something I never heard of. All in all, educational and funny! Thank you - I will have to read your Haikus! I don't know if it should be capitalized. I did this prompt because I thought it would be easy, and then I ended up writing this whole ridiculous post. And then once I started the haikus I couldn't stop. Or should I say Haiku? Poetry is hard. I love haikus. One of my friends puts hilarious ones on Facebook. I like the counting part. I like the counting part too. There's definitely an art to saying what you want to in so few words. I can't believe you still have that poetry book from elementary school!!!!!!! How the spelling error has haunted you over the years. Maybe now that you have had your public confessional it can now rest. Like Leigh Ann, I find haikus fun because of the counting. In school they were liberating because there was no need to rhyme, and it was math-like. They make me smile. I do love the liberating ease of the haiku. The pages were in my baby book, so of course they were untouched for years. :) Hopefully you're right about the haunting. And I thought I couldn't love you more. I'm REALLY impressed that you could actually find that book from elementary school. You must have some badass organizing skills. Great post! I definitely need to add the artful cinquain to a future prompt. I particularly enjoyed your dogs. dogs. You really made the poem your own with that misspelling. I was really ahead of my time. Cinquains are where it's at - lets bring them back! !